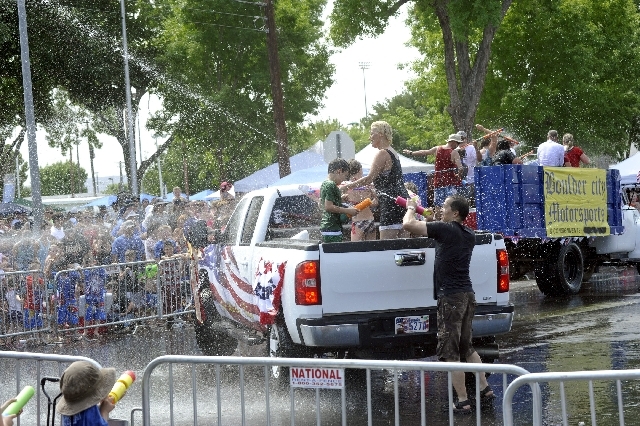 After a publicity campaign by the city, not one water balloon was seen thrown during the Damboree Parade on July Fourth. Police Chief Bill Conger was pleased with how the crowds behaved during the parade. City Parks and Recreation Director Roger Hall first approached the newspaper about the water balloon ban in March, with an article announcing the crackdown April 4. The police department also discussed the ban in its weekly newspaper column. City police wanted to discontinue the water portion of the parade after several incidents the past few years, including a jeep hitting a spectator and water balloons flying at high speed from make-shift slingshots. Past parade participants had reported that some water balloons were even partially frozen. Hall said there was none of that activity this year. “The word got out,” Hall said. The city made 20 big yellow signs that lined the pedestrian rail along the water route on Fifth Street from Aztec Place to Avenue B, then south on Avenue B, warning of the water balloon prohibition. Although no water balloons were thrown, city employees and the police found coolers with water balloons, but people cooperated in getting rid of them when told of the ban, Hall said. There was also a lot of self-policing. “I heard, too, that people that came in from Las Vegas who did have water balloons. People around them said, ‘Hey, water balloons are not allowed. There’s a lot of police around,’ ” Hall said. The city also erected barriers along the water route that kept spectators from entering the street or trampling residents’ yards along the route. Hall said about 7,000 people attended the parade, 10,000 attended the post-parade activities at Broadbent Park, and 20,000 were at Veterans Memorial Park for the Fourth of July fireworks that night. Conger said that besides an early family disturbance and some illegal fireworks calls, the day went by without any major incidents for police.